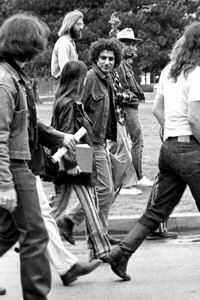 Birth of Abbie Hoffman (1936-1989), American social and political activist. After the failure of the attempted invasion of Cuba (the Bay of Pigs invasion) U.S. President John F. Kennedy authorizes the CIA to launch covert terrorist operations against Cuba. Named Operation Mongoose, the operations involve U.S. military forces as well as the CIA, and include a variety of terrorist tactics, including repeated attempts to assassinate Cuban President Fidel Castro and other key leaders, economic sabotage, destruction of crops, and support for military raids by gangs of exiled Cubans. Tens of thousands of activists, students, union members and environmentalists demonstrating for global justice shut down the World Trade Organization (WTO) summit in Seattle, Washington. International media coverage largely ignores both the blockade and the police riot (and an enormous labour-sponsored rally and march), focusing instead on minor property damage committed by a fringe group of a few dozen Black Bloc anarchists. Loren Goldner: Seattle: The First US Riot Against “Globalization”?